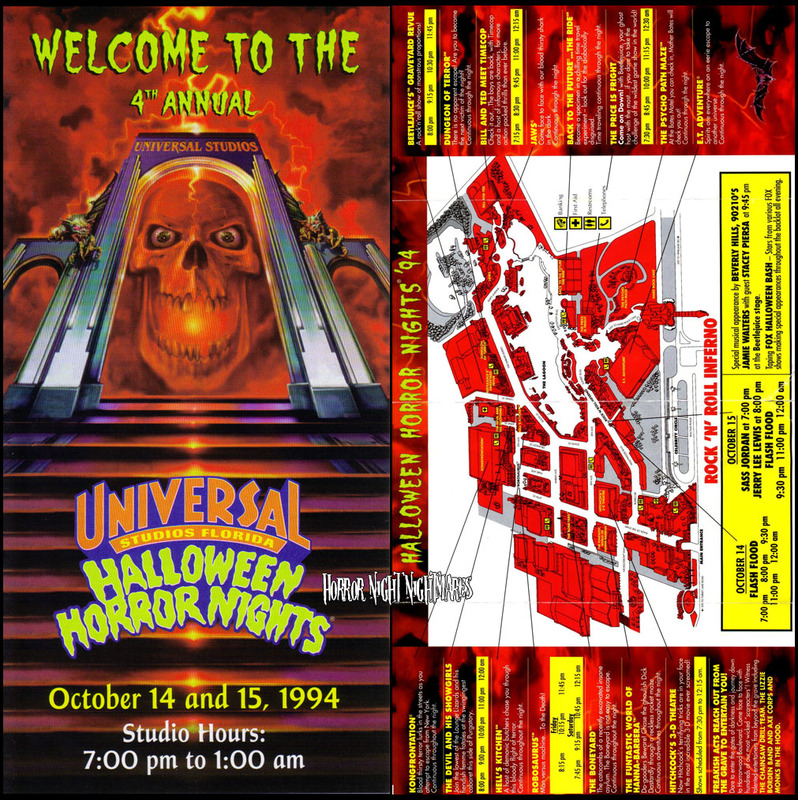 Halloween Horror Nights IV was the first Horror Nights event to incorporate Scare Zones, making “Horrorwood” the first ever Halloween Horror Nights Scare Zone. These Scare Zones were developed to centralize the Scare Actors, help lessen safety issues, and improve the overall atmosphere of the event. The Scare Zones also allowed for theaming of areas outside of the haunted houses, creating “streets” that belong in their own separate realm of terror. Gates opened at 7:00PM till 1:00AM. The Catacombs of a recently excavated insane asylum. The Boneyard is not easy to escape. There is no apparent escape! Are you to become the next victim of the night? A host of demonic butchers chase you through this bloody flight of terror. At the Bates Motel you can check in, Mother Bates will check you out. Featuring: The Chainsaw Drill Team and The Lizzie Borden Band and The Axe Corps and Monks in the Hood. Check it out…The boys are back, with Timecop and a host of infamous characters, for more action-packed thrills than ever before. Join the lowest of the Lounge Lizards and his fiendish femme fatales at the singingest cabaret this side of Purgatory. Come On Down! with Beetlejuice, your ghost host with the most…if you dare to take the challenge of the wildest game show in the world! Man versus machine…To the Death!